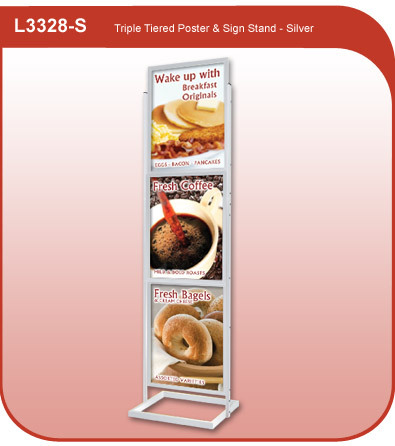 The ThreeTiered Poster and Sign Stand is an excellent long-term solution for displaying your advertising signage and promotional graphics. The TripleTiered Poster and Sign Stand can hold three 22" x 28" posters on each side giving the ability to display up to six signs at once. The model L3328-S is an aluminum sign stand that has an offset design that makes changing the graphics quick and easy. Over all height measures 89" and has a sturdy rectangular base.